The extensive slopes and high summits of the Lawers group dominate the area to the south of Glen Lyon, a wild, unique and unspoiled glen with a diversity of forests, lochs and waterfalls. Meall Corranaich and Meall a' Choire Leith, the two Munros in this walk, lie to the west of the Lawers group and range northwards from the bealach at the watershed between Glen Lyon and Loch Tay. There are, essentially, two popular routes to follow over these hills; one that begins from a point to the north of Lochan na Lairige, and this one from the Ben Lawers National Trust for Scotland Visitor Centre. Both have the advantage of already being at a high altitude that gives a good start to the day. Bear in mind that this gives other hillwalkers a good start to their day also so start early and meet the crowds on their return rather than being part of them on the way in! 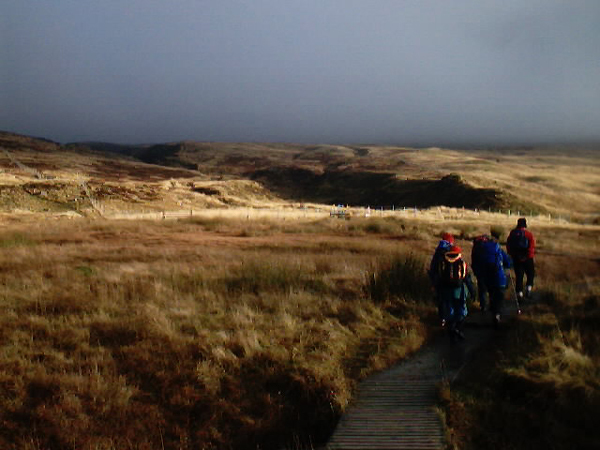 The route begins on a series of raised walkways over marshy ground, and follows the Burn of Edramucky through the nature reserve that is fenced to allow recovery of the vegetation by keeping out sheep. At a junction in the path, identified by a cluster of large boulders, and about 100m/110 yards from the exit from the nature reserve, bear left and follow the old drove road up Coire Odhar to the bealach at 880m/2887 feet (GR: NN 621408). The drove road continues over into the next valley where once their were sheilings used by the drovers when they took their cattle out to higher summer pasture - yet another way of life that has long since been committed to the social history books since the Highland clearances. A line of rusty fence posts marks the beginning of the next part of the route as it turns west-northwest and ascends steeply up the ridge to the small cairn marking the summit of Meall Corranaich. The path is very steep, but achievable, and care should be taken to avoid a slip or fall. Leave the summit northwards down the broad, gently sloping ridge for about 1km/0.6 mile to where it divides. It is essential to follow the north-northeast - right hand - ridge away from the summit to avoid a wasted descent - and subsequent hard climbing recovery. Continue the descent to the col above Coire Liath at 770m/2526 feet (GR: NN 614431) beyond which an obvious path leads up to the broad, flat topped summit of Meall a' Coire Leith. It is worth remembering where the path ends and the route continues across the top to the low pile of stones for the return section of the route. The return is normally documented as a reversal of the outward one. However, the thought of a re-ascent of Meall Corranaich, followed by the steep descent off its southern side may be a daunting prospect. Leave the summit of Meall a' Coire Leith keeping to the east to regain the path back down to the col above Coire Liath from where several paths fan out towards Meall Corranaich. Follow the uppermost - left - of these as it passes as close to the top of the crags as is safe to do so until reaching the 900m/2953 feet contour then pass through a very short section of the crags. Taking care to avoid a slip or fall, follow the gentle descent southwards across the east slope of the ridge, crossing near the head of a small stream - where the path becomes somewhat intermittent - to end on the 880m/2887 feet bealach at the head of Coire Odhar (GR: NN 621408). It is pleasant stroll downhill on the old drove road from here back to the start. Map OS Landranger sheet 51, OS Explorer sheet 378 or Harvey's Ben Lawers. Start/parking Ben Lawers NTS Visitor Centre car park. GR: NN 608379. There is a voluntary 'contribution based' parking charge (currently �2) to raise funds for the ongoing historic landscape project. The access road from the A827 east of Killin to the Visitor Centre, and Glen Lyon, is not kept open in adverse winter weather. Grading A relatively straightforward route over two Munros starting from around 400m/1312 feet. There is one very steep section to the summit of Meall Corranaich. The remainder is on easy terrain once at altitude. Ideal for fit adults and older children. Full protective weather clothing and navigational equipment must be carried. This is sheep grazing land, in the main, and dogs should be kept on a lead.